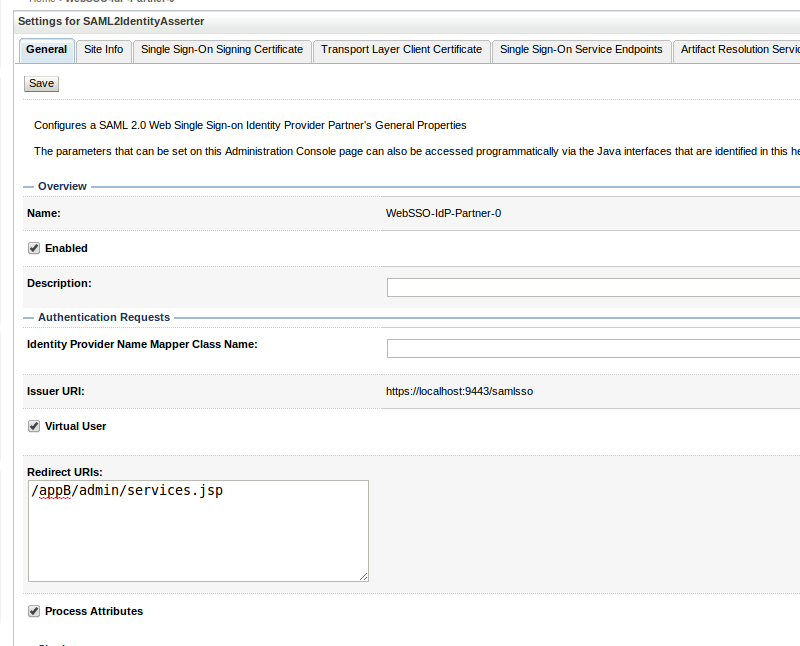 This blog post explains How to configure WSO2 Identity Server as SAML2 IDP and Oracle Weblogic as Service Provider. You might already know that there are two parties engaged in a single sign on system. So there should be a mechanism for the identity provider to know that this is an authentic service provider and at the same time service provider needs to know that authentication response came from a trusted identity provider. This secure transaction between IDP and SP is ensured by sharing metadata files of the two parties. 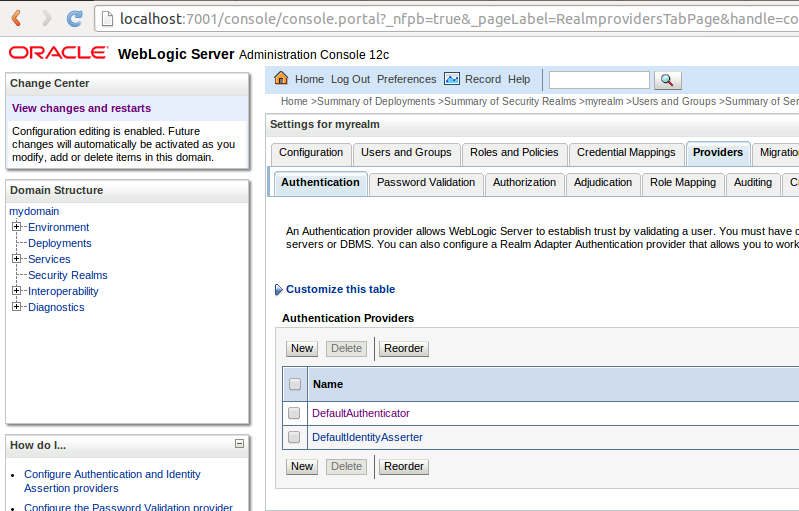 First let's see How can we configure Weblogic as a Service Provider. First you need to download and install Weblogic server. You can download it from here and follow the README.txt for the installation. NOTE: Make sure you configure a new domain if you do not have one already. We will be using appB as the sample test application which you can download from here. 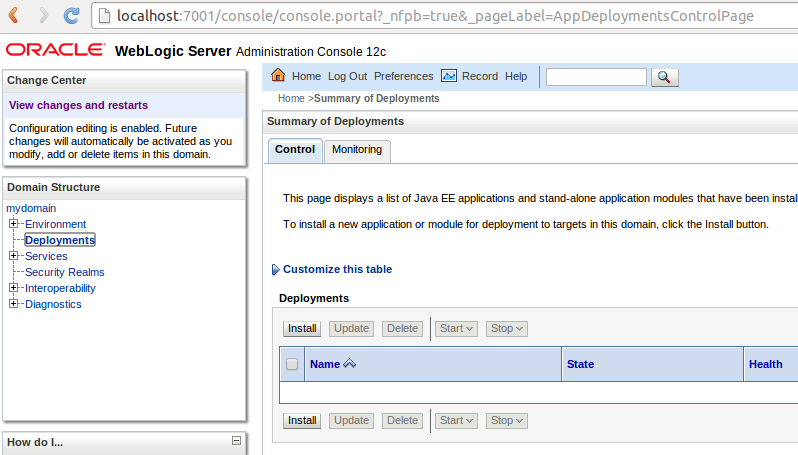 Deploy appB in the Weblogic server. Go to Deployments under <mydomain> and click install. Click upload your file(s) and browse appB. Keep all the default options and finish deployment. 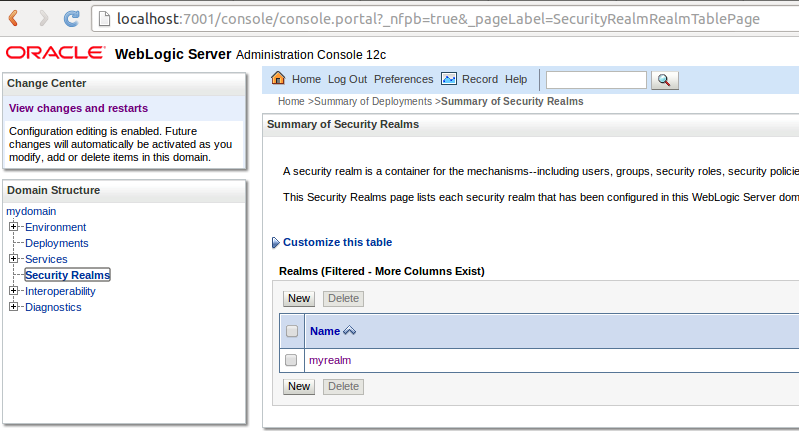 Create a user in security realms. Providers tab --> Authentication tab and select New. Click on New and select New Web Single Sign-On Identity Provider Partner. Click on the just created Identity Provider Partner and fill the details, tick the options as below and Click Save. Verify whether your metadata file has parsed correctly by navigating to Single Sign-On Signing Certificate tab and Single Sign-On Service Endpoints tab. Go to Environment --> Servers and Click on myserver(admin). Tick the SSL Listen Port Enabled option and Save. NOTE: We will be using the demo Keystore and if you need you can have your own custom keystore. Go to Federation Services tab --> SAML 2.0 General tab. Fill the fields with relevant information as shown below and Save. 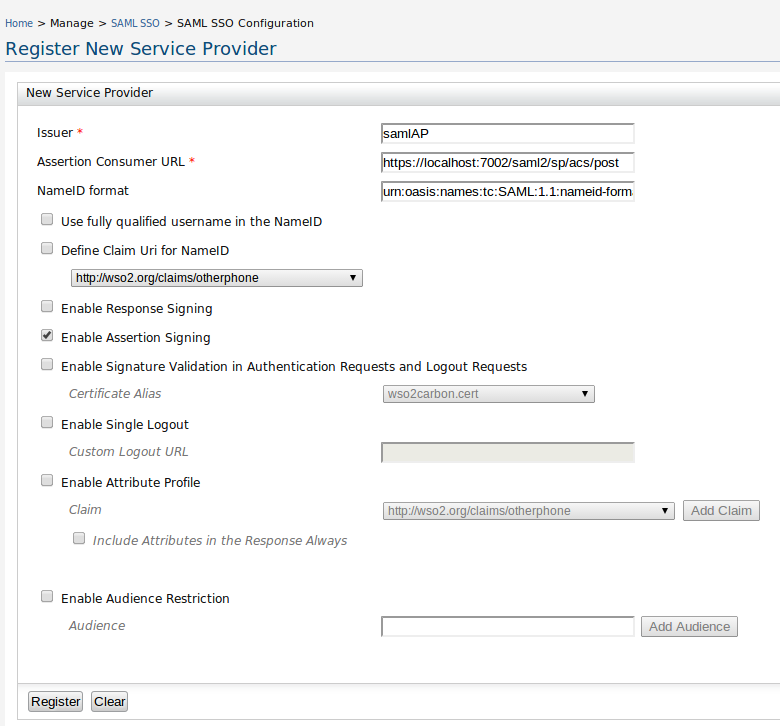 SAML2 Service Provider Tab configurations. 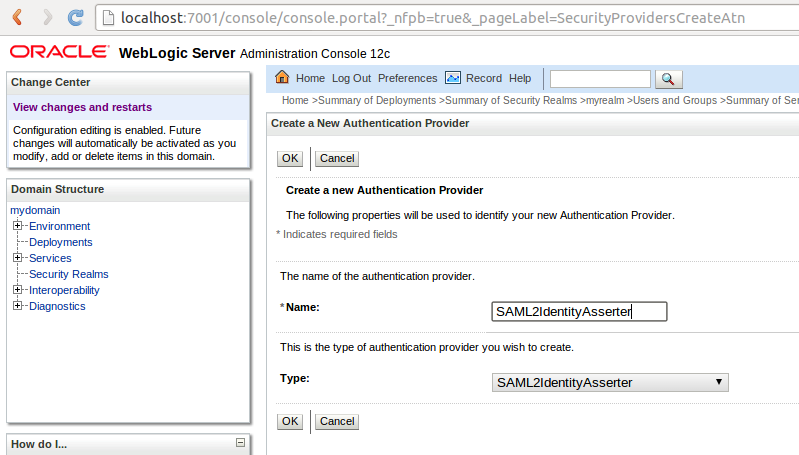 Go to Federation Services tab --> SAML 2.0 Service Provider tab. 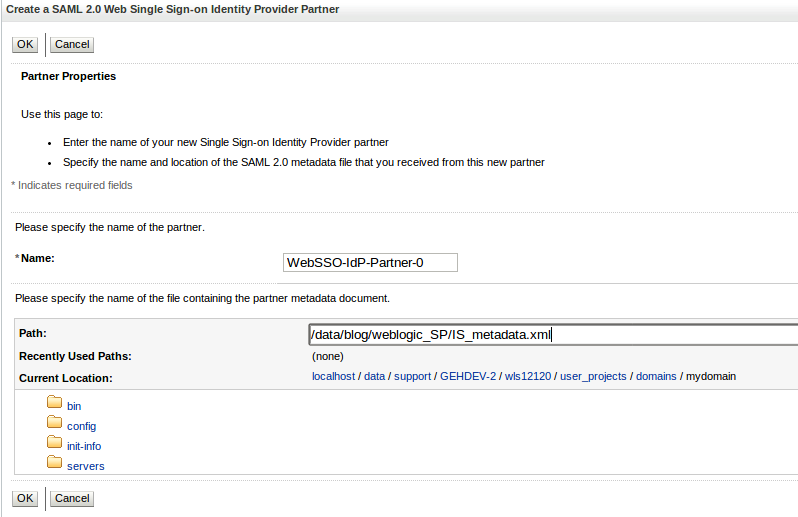 Go back to SAML2 General tab and Click on Publish Meta Data. Provide a location to save the Weblogic metadata file. Create SAML Authenticator choosing the type as SAMLAuthenticator. Click on the just created SAMLAuthenticator. Go to Configuration tab --> Common tab and select Control Flag as Sufficient. Go to DefaultAuthenticator and select Control Flag as Sufficient as well. 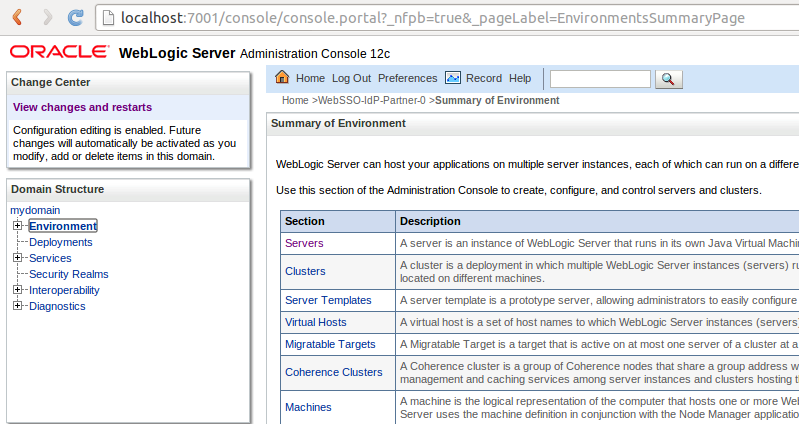 Now we have done with configuring Weblogic server as the service provider. 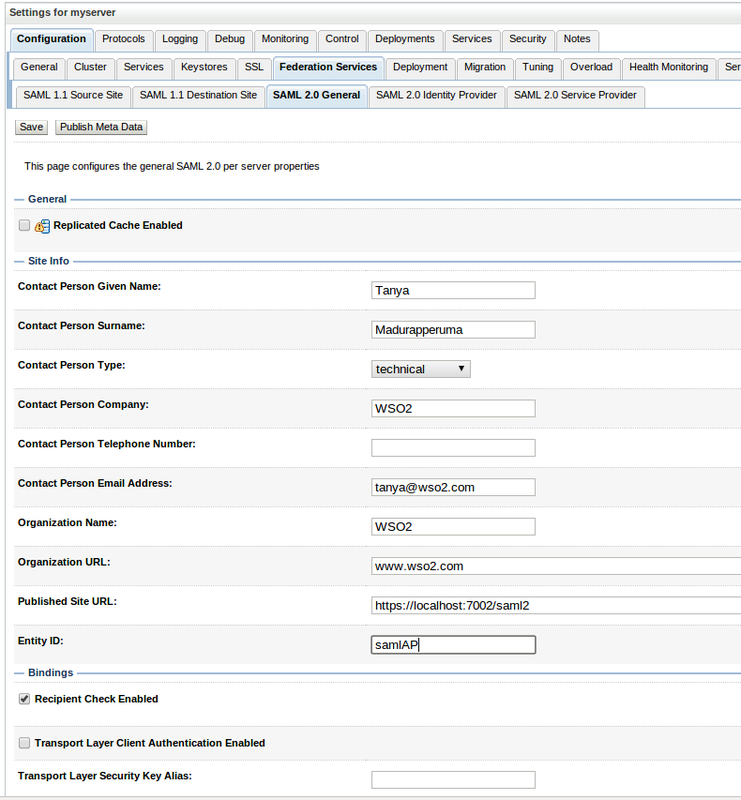 Let's have a look how can we configure WSO2 IS to serve as the Identity provider. 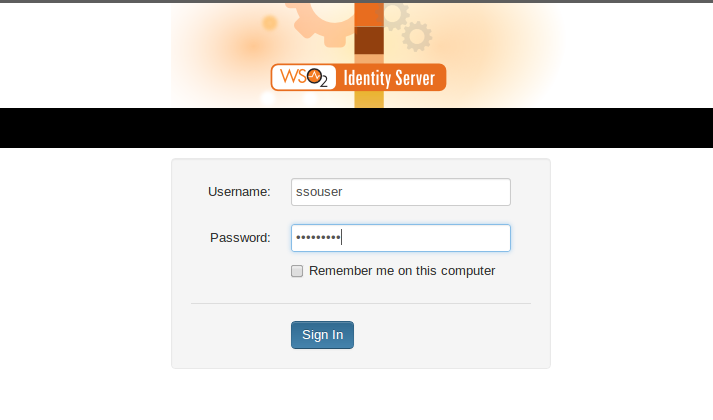 Start WSO2 Identity server (tested in IS 4.5.0) and login as admin. 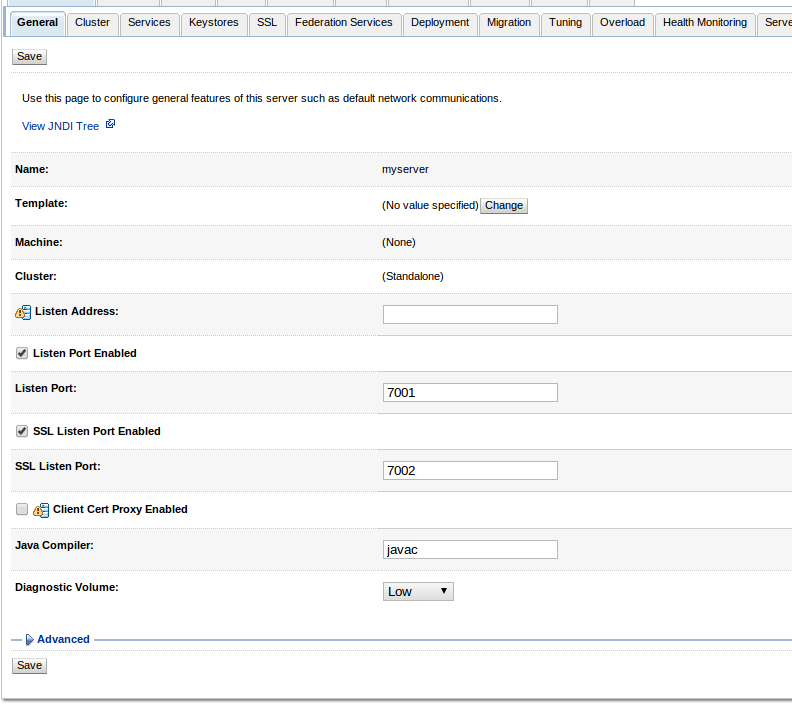 Create the same user you created in Weblogic server in Identity Server. Go to Configure tab and click on Users. Click on Add New User and add the same user. Give Login permission to that user. 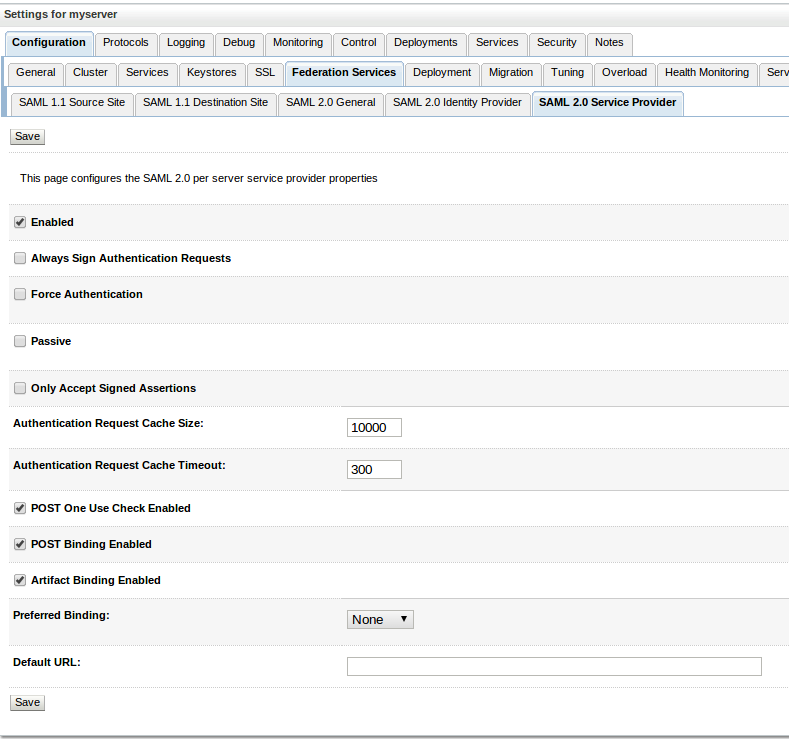 Go to Main tab and select SAML SSO under Manage. Click on Register New Service Provider. Fill the data as below and click Register. 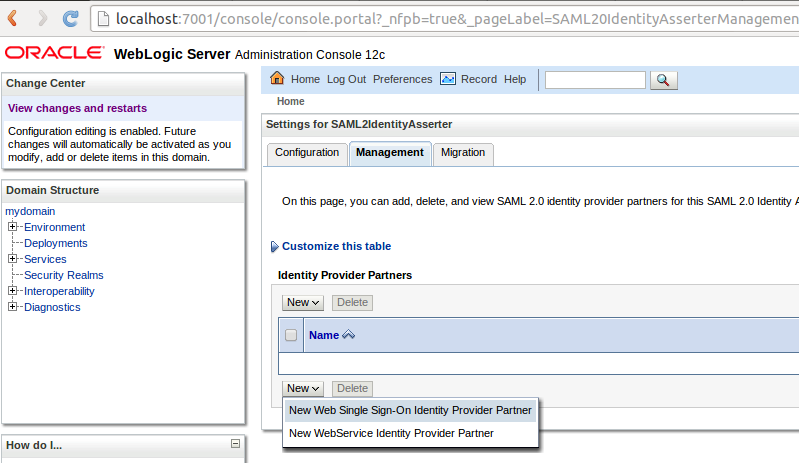 Now we have done with configuring both IDP and SP and it's the time to test the SAML2 Application. Restart the weblogic server + WSO2 IS and go to http://localhost:7001/appB/admin/services.jsp and you will be redirected to WSO2 Identity server SAML sso page. If you see the below page, Congratulations !!! 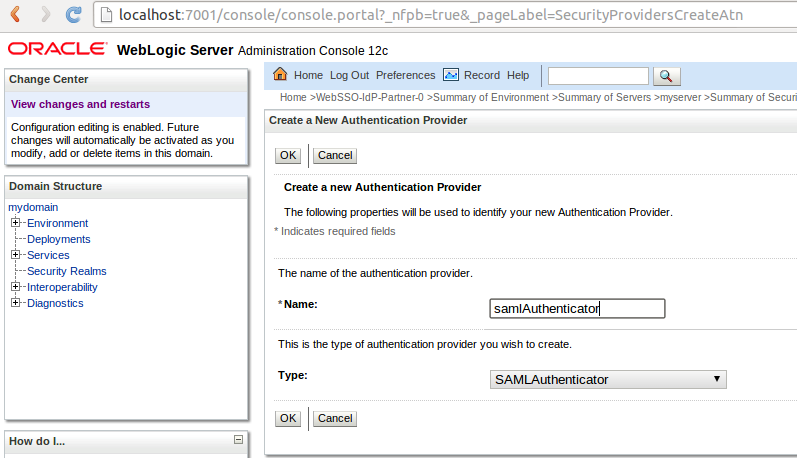 You have configured WSO2 IS as SAML2 IDP and Weblogic as SP. My thanks goes to Prabath and Dulanja at WSO2. Gilles for this excellent blog post. Is there a configuration setting in weblogic or wso2 that would correct this and ensure that the user is a member of the group poc before granting authorisation. At the moment. The user is authorised as long as they have been setup and they enter the correct password. Will try it out and update you soon. 2. 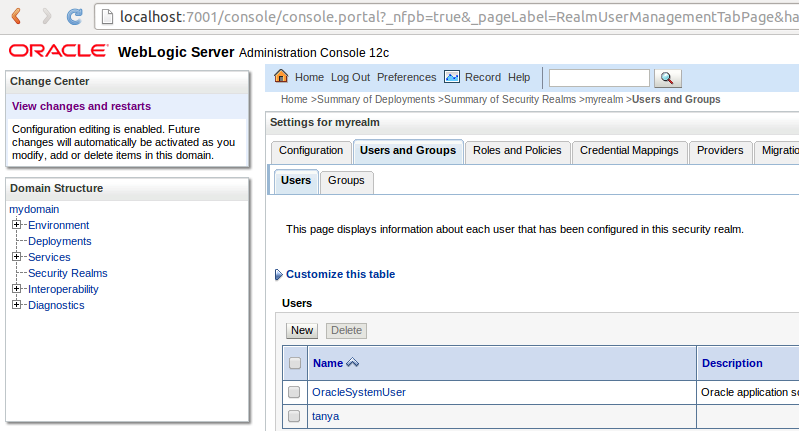 Create a group in weblogic server as poc and the authorized users to that particular group. How you get metadata from wso2? Sorry for the delay in replying. Currently WSO2 Identity Server is not capable of generating a metadata file. But sooner we will provide that feature with a future release. I have prepared the above given metadata file manually considering the available standards. hi when I am logging in as ssouser/welcome1 I am getting authentication failed "Authentication Failed! Please Retry" from WSO2 login page. Could you please tell me what I am doing wrong here? I really need help understanding this. I wish you still checked this blog. Hi, I've been able to configure the SAML SSO as you describe above. Now I wonder how can I issue a logout request to WSO2 IS? Could you give me an insight to achieve this? At the service.jsp you will see a line like below. Please note that this is due to an api change from Oracle side and not due to any change in WSO2 side.